Would You Like to Quickly & Easily Capture Labor & Quantities on the Shop Floor? In the manufacturing industry today, many companies are unaware of how productive their workers are or what it really costs to make their goods. They use estimates or standards to project labor costs. Most say that they would love to do a better job with this, but the solutions available are too complex. Meet RF-SMART’s Work Center Execution. Work Center Execution is a tool that allows production workers to record value-added material and labor without disrupting their productivity - it makes reporting easy! How does Work Center Execution work? 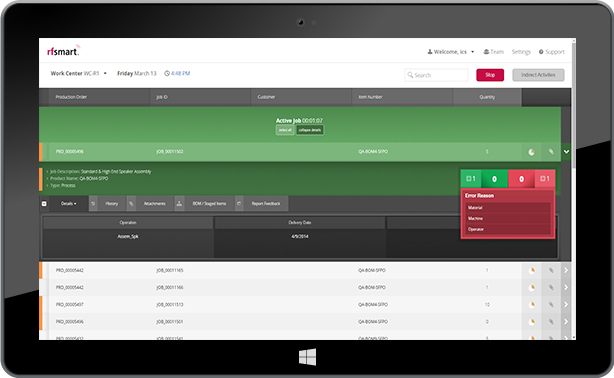 Work Center Execution is a web-based, touch application that helps manufacturers translate resource time into actionable productivity and cost metrics. With just the tap of a screen, shop floor employees can start a production job, report their progress, view work instructions or CAD drawings and then print a finished goods label. Experience how RF-SMART's Work Center Execution can help you improve your warehouse.